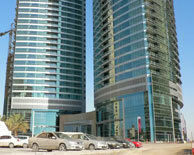 The Al Fattan Marine Towers is a complex in the Dubai Marina section of Dubai, United Arab Emirates. The towers are located within Jumeirah Beach Residence, a 40-tower, 7,000 unit residential and hotel development which runs alongside Dubai Marina. The Al Fattan Marine Towers consist of two twin 50-story towers, the Al Fattan Tower, and the Oasis Beach Tower, consisting of serviced and residential apartments which have since been sold to individual investors and homeowners. Both towers stand at a height of 245 m (804 ft) and a roof height of 230 m (755 ft), and are the tallest buildings in Jumeirah Beach Residence. Construction of both towers was completed in 2006. Following completion the developer, Al Fattan Properties LLC built a 12-storey office and retail building on an adjacent plot between the towers and Dubai Marina restricting views of the marina from the towers. In 2012 Al Fattan commenced construction of two high-rise towers on the beach in front of the towers which will largely restrict seaviews from Al Fattan Marine Towers. Al Fattan had earlier demolished a 10-story hotel on the site, the Oasis Hotel, which it had built about a decade earlier. Originally Al Fattan proposed to build a mega 97-tower building on the site to be called Burj Al Fattan, however a subsequent decision was made to split the development into two high-rise towers. The exact number of floors is not known as there has been no public disclosure of the project although construction has started on the site which is surrounded by billboards showing an artists impression of the two towers and the name Crystal Towers. Al Fattan Properties LLC was founded in 1974 by its chairman Major General Musabbeh Rashid Al Fattan. The major general has been a member of the Executive Team of HH Sheikh Mohammed bin Rashid Al Maktoum, Vice-President and Prime Minister of UAE and Ruler of Dubai, for more than thirty years. His association with the Dubai ruling family began in 1972, when he was among the cadets sent by the late Sheikh Maktoum bin Rashid Al Maktoum, the former Ruler of Dubai, for higher studies at the Police College in Iraq. Musabbeh attributes the success of his company to the vision and leadership of the present Ruler of Dubai, depicting a photo of Sheikh Maktoum on the homepage of the company's website and saying "Al Fattan thanks His Highness Sheikh Mohammad Bin Rashid Al Maktoum, Vice-President and Prime Minister of the UAE and the Ruler of Dubai, for his vision and leadership without which our success as a property developer would not be possible." Al Fattan Properties LLC is a large developer of villas, offices, retail complexes, warehouses, hotels and resorts. A major project completed in 2012 is a 5 star 259 room beachfront resort on Palm Jumeirah which also houses 28 luxury residences. The resort, managed by Turkish luxury hotel chain Rixos Hotels has been named Rixos The Palm Dubai.